Find Out How To See a Live Magician! Better than free, because it's DOUBLE FREE!! Don't see our flash images? Get free Shockwave Player. 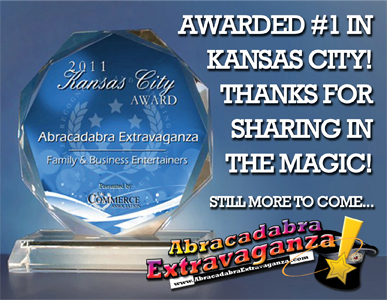 Kansas City's Premiere Award Winning Magic Party & Event Services! Offering Fantastic Magic Shows, Live Animals, Balloon Sculpting, Face Painting, Caricatures, Juggling, Bounce Houses & More! Be it a small private party, festival, birthday, or an enormous state fair, we’ve performed for private, public, & corporate events across the USA. We have years of specialized training & experience in creating a great time! Add our show to any event & let us bring the party to you. You have the guests, we have the fun: Abracadabra Extravaganza! "Why should we choose Abracadabra Extravaganza?!?" Customizable shows to fit your special event or theme. Fully licensed & insured full time professional entertainers. Our shows are completely self-contained – just add your guests! 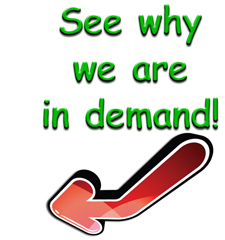 A Great show & fantastic service at a reasonable price! Award winning professionals with quality experience. Dependable - we've never been late & we never miss a performance. We guarantee laughter & smiles from our show. Year after year, our clients come back for more. As if by Magic - we can appear at your event! Abracadabra Extravaganza - putting the WOW in magic one audience at a time!